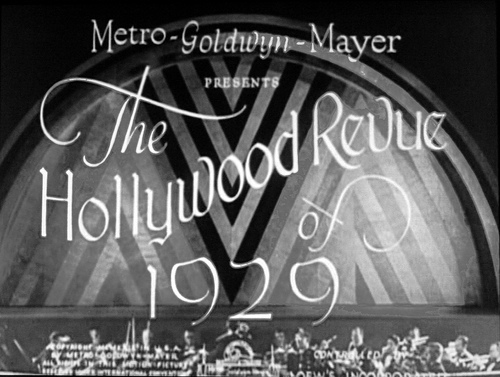 The Hollywood Revue of 1929 is a part Technicolor Metro-Goldwyn Mayer American musical-comedy film. 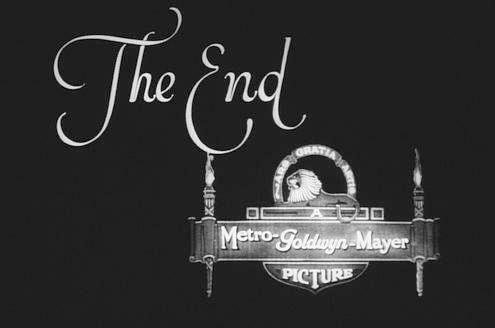 It was the studio’s second feature-length musical, and one of the earliest ventures into the talkie format. 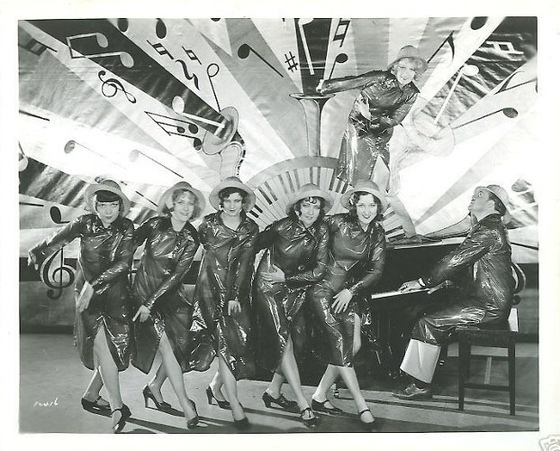 Produced by Harry Rapf and directed by Chuck Riesner, the film brought together some of MGM’s most popular performers in a lavish two-hour revue. The two masters of ceremonies are Conrad Nagel and Jack Benny. 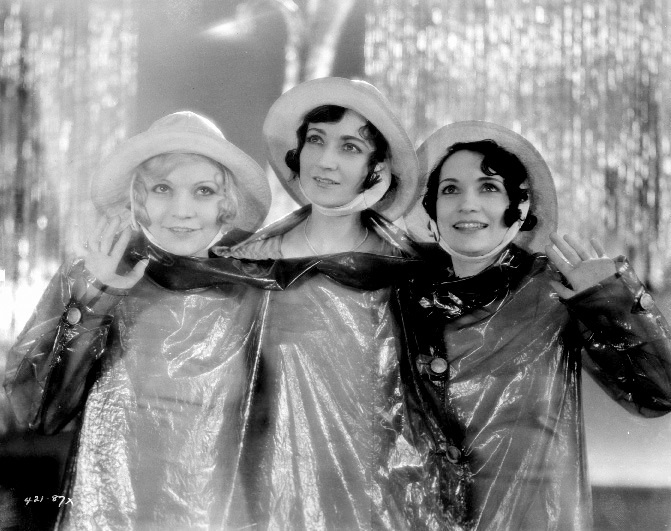 Unlike M-G-M’s imposing feature films, which always boasted strong story values, The Hollywood Revue of 1929 was a plotless parade of variety acts. Conrad Nagel, interviewed for the book “The Real Tinsel”, recalled, “Everybody thought Harry Rapf was crazy for making it.” Billed as an “All-Star Musical Extravaganza,” the film includes performances by once and future stars, including Joan Crawford singing and dancing on stage (She later remarked, “Revue was one of those let’s-throw-everyone-on-the-lot-into-a musical things, but I did a good song-and-dance number.”). 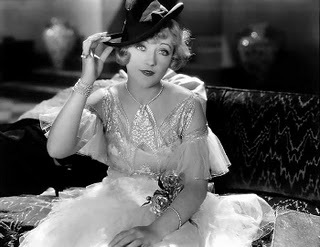 Other segments feature Lionel Barrymore, Marion Davies, Gus Edwards, John Gilbert, Buster Keaton, Marie Dressler, Anita Page, Norma Shearer, and the comedy team of Karl Dane and George K. Arthur. 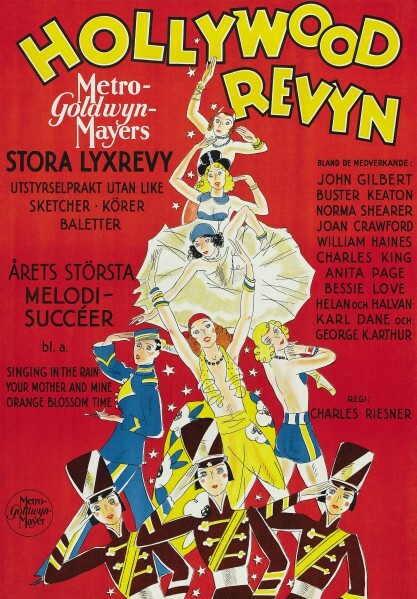 Highlights of the film are musical performances (including the debut of “Singin’ in the Rain”) performed initially by Cliff Edwards (“Ukulele Ike”) and later performed at the end of the film by the entire cast) and a comedy routine starring Stan Laurel and Oliver Hardy as inept magicians. 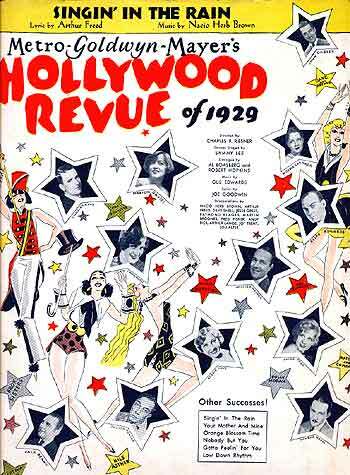 The only major M-G-M stars missing from the revue are Greta Garbo, Ramón Novarro, and Lon Chaney, Sr. (Although Chaney is referred to by name in one of the songs performed). 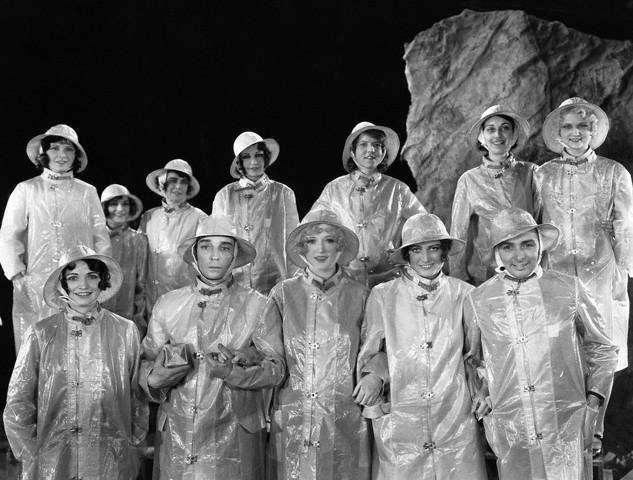 Vodpod videos no longer available..
Singin’ in the Rain (Nacio Herb Brown, Arthur Freed) – Cliff Edwards as Ukulele Ike introduces the number. At about 2:25 the chorus is taken up briefly by a male vocal harmony group (offscreen); then come the Brox Sisters, followed by another turn by the men. 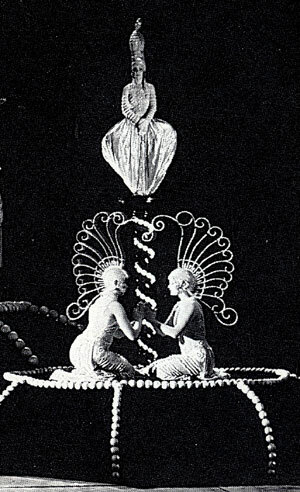 The Albertina Rasch Ballet performs a dance staged by Sammy Lee in a production number, filmed in two-strip Technicolor, for the song Orange Blossom Time. 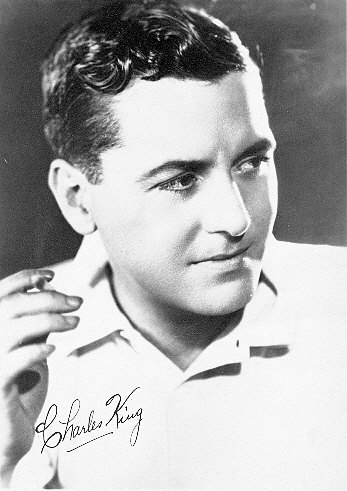 Sung by Charles King to Myrtle McLaughlin. One site mentions another group, the Belcher Child Dancers performing as “pirouetting blossoms” in the number. I haven’t discovered any evidence of pirouetting blossoms in the clip, but I believe the Belcher Dancers may drop from the sky on swings in the ensemble finale. There is a fade and cut at about 2:28, several seconds prior to the entrance of the Rasch Ballet, but this seems like an intentional edit rather than a sign that a portion of the number may be missing. There is at least one frame in which King and McLaughlin are seen both walking up a flight of stairs, backs to the camera while fading out, and standing at the bottom of the stairs facing toward each other, before they walk away toward the rear as the dance portion begins. There are several numbers listed in the IMDb Soundtracks page for the film that Wikipedia, which uses “the circulating print,” does not include in its Musical Numbers lists. I haven’t found all of them in video libraries, but here is one which I couldn’t find when looking for it, that turned up during a search for numbers from another film. 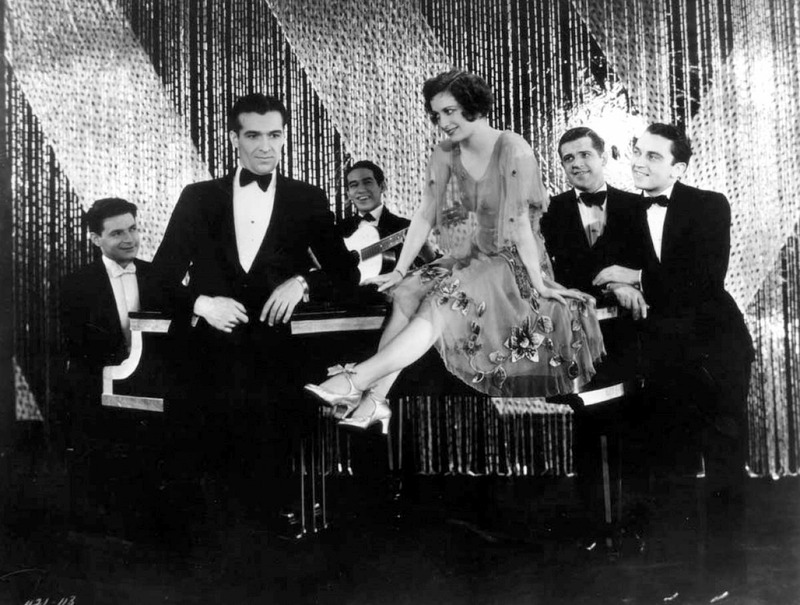 Tableau of Jewels (Fred Fisher) – It is sung by James Burroughs, according to the YouTube provider; IMDb says that it is “[s]ung by an unidentified male.” The number is danced to, according to IMDb, by Carla Laemmle and Buster Keaton in drag. However, Keaton does not appear in this number. He is in drag in a comic number called The Dance of the Sea which I’ve excluded because the quality of the clip in a video I found was rather poor. 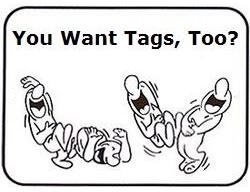 I’ve also omitted comic skits involving Jack Benny, Laurel and Hardy, and others. 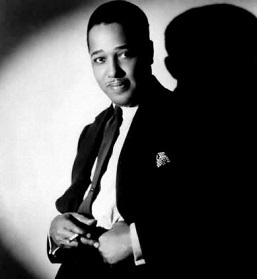 Songwriter Fred Fisher is perhaps best-known for hits such as Chicago (That Toddlin’ Town), Come Josephine in My Flying Machine (lyrics by Alfred Bryan), and Dardanella (lyrics by Felix Bernard and Johnny S. Black). 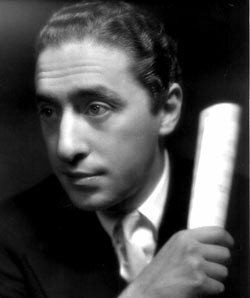 *Carla Laemmle turned 102 on 20 October 2011. 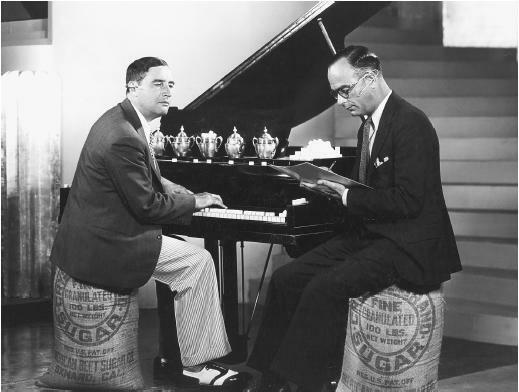 (above) Nacio Herb Brown and Arthur Freed. It takes a lot of tea to write hit songs. A lot of tea. Wow! I was looking for a bit of 1929 to “freshen up” a letter to my aunt, who was just 15 in 1929, hoping to throw in a little spice to offset the dour reality of the stock market crash and here I am! Wonderful site, wonderful show, wonderful memories for a dearly beloved “old girl”. Thanks for this wonderful opportunity to relive her childhood!